Join us to make this super comfy sweater. This drop-shoulder crew neck has it all - texture, faux seams, and plenty of positive ease. It will likely become your favorite sweater due to its versatility and flattering fit. 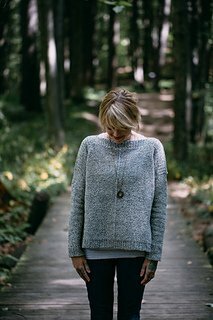 The body of the sweater is created with the purl side out, while the sleeves show the knit side of the fabric. Complete a gauge swatch as follows - With US 9 needles, cast on 36 sts, work in stockinette for 4". Bind off. Block. Bring to class. Read through the pattern before class; make sure to bring all of your supplies to the first class. Cancellation Policy - Student cancellations must be made at least two weeks prior to the first session to receive a refund for the class fee. After that date, class fees are not refundable and cannot be transferred to another class. Any yarn or supplies purchased for the class are subject to 3 Kittens' normal return policy. 3 Kittens will only cancel a class if no students have signed up; however, we may need to reschedule due to weather or illness.